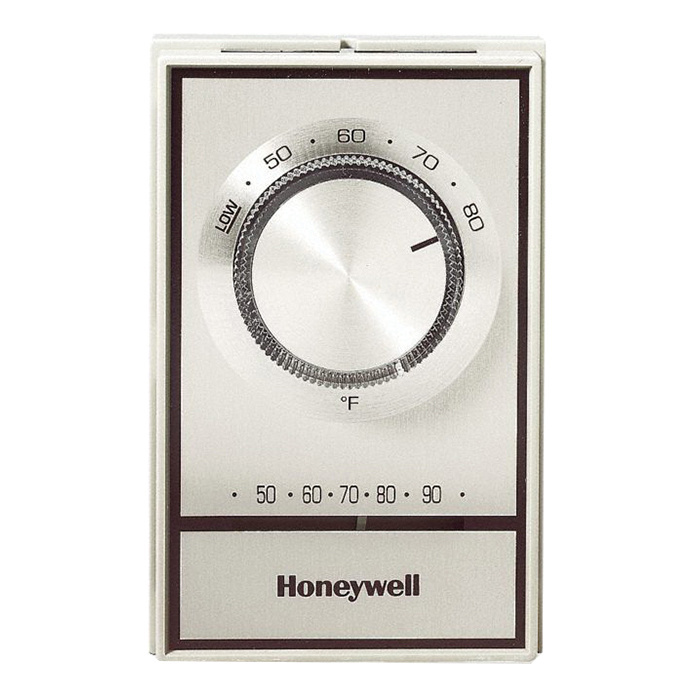 Honeywell Tradeline® Non-programmable electric heat thermostat is specifically designed to maintain the temperature of a system at the desired set point. This thermostat in brush gold color, is current rated for 22-Amp at 120/208/240-Volt AC, 19-Amp at 277-Volt AC and voltage rated for 120/208/240/277-Volt AC. The bimetal sensor element supports temperature ranging from 5 to 27 deg C through dial. It offers connection through 6-Inch black and red lead wires. The device supports vertical mounting. The rugged, engineering plastic mounting base with captive mounting screws give complete flexibility. It has a dimension of 73 mm x 33 mm x 116 mm. This device includes range stops, locking cover and extra knob decal for recalibration. It is perfect for electric baseboards, convectors and fan forced heaters. Thermostat is UL listed and CSA certified.